I was finally able to fix the scalera so I hope you can enjoy them now! 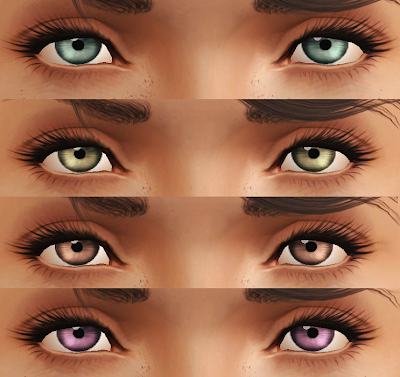 -You can now change the eye color without changing the whites! They're lovely! I wish i knew how to make my own CC. 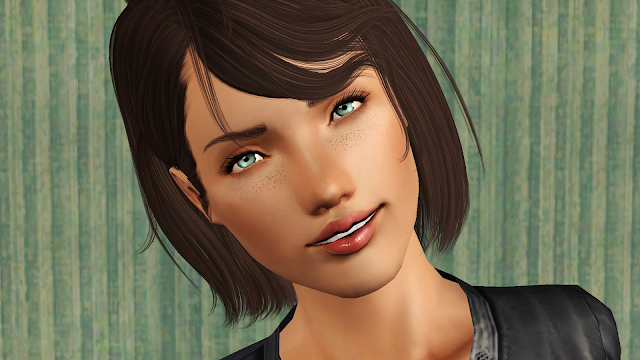 I made her skin a little darker, so you can see that there's something wrong. I wonder what went wrong since on your screenshots the eyeball looks totally fine. Hmm that's odd. Are you sure that those are my eyes? Did you delete your previous defaults and then install mine? I'm pretty sure these are yours 'cause I deleted my other default eyes before putting in yours. But then again these eyes on my screenshot don't look like the eyes you did. Really odd. I don't know if I'm the only one with this issue, so if I would be the only one, it must have to do with one of my other mods. Ok I checked it again. These eyes aren't yours after all. I'm sorry that I have caused confusion and trouble!! I checked your picture in GIMP and they didn't look like mine either :) I'm glad you got it fixed and no harm done! Is your model available for download? Sorry but I haven't uploaded her yet.